I was wondering about GM CEO Rick Wagoner's political contributions record and whether that might have somehow been a factor in his ouster at GM by our new, more "invested" administration. Upon locating this site, I found that he very meticulously played both sides of the fence. Weasel. But as I said, I stumbled upon www.newsmeat.com. What a site. Still think privacy is possible in America? Check it out. This site not only lists celebrity donations, but you just may find your neighbor there (or yourself). I've been doing some work on my federal taxes here. Is it just me or do taxes keep getting more and more complicated and incomprehensible every year? My thoughts turned to why there is such a thick morass of tax rules and regulations. I'm not talking about the need for taxing us to do some things that the state and federal governments must do. But how in the world it got to be the maze of legalese that it is. It is of course an accumulation of decades worth of politicking. The flip side is that politicians love to also talk about simplifying the tax system, though that seems to be an impossible dream when it comes down to it. Something massive happens to the USA. The people come out of it demanding realistically minimalist, manageable, accountable government. They want to be able to afford the services they are provided and they want it to be based on fairness--not on welfare-ism or socialism or cronyism, etc. Everyone is responsible and pulls their own weight. I know, I know, but remember--this is a dream. So what IS the most fair basis for taxing a population? I believe a majority of people would say a straight income tax--a given percentage based on actual income. But how fair is that really? You still have some people working harder than others to make more income and thus pay more taxes (with the less motivated or unaccomplished piggybacking on the achievements of those who are already leading the way in terms of being employers, technological innovators, etc.) . OK--yes, that WOULD be huge improvement over what we have now. But what if instead, there was a straight tax levied against a household based solely on the number of people in that household? Each person responsible for their own exact share of their ownership of their country. I don't know. It seems to me that if the tax laws were that simple and straightforward--citizens across the board, each liable for one consistent fraction of the governmental budget, would be far more likely to willingly do their part to ensure the government is responsible in how it manages its tasks. Also, those who choose to work hard would not be penalized for doing so, to get ahead. In fact, they would be rewarded more directly than they are now under the current system. And those who choose to sandbag would quickly be found lacking and perhaps they would need to be finding a new homeland better suited to their limitations. Sure, that would be hard on some, but I think simple can be better; and in an arrangement like that, families would be taking care of their own, working hard together to get ahead, not scheming to beat the system, since headcounts would be pretty easy to verify. "The night before the burial of her husband's body, Katherine Cathey refused to leave the casket, asking to sleep next to his body for the last time. 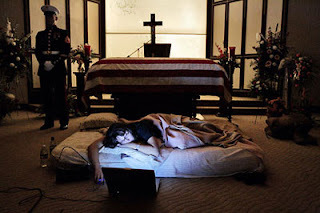 The Marines made a bed for her, tucking in the sheets below the flag. Before she fell asleep, she opened her laptop computer and played songs that reminded her of 'Cat,' and one of the Marines asked if she wanted them to continue standing watch as she slept. 'I think it would be kind of nice if you kept doing it,' she said. 'I think that's what he would have wanted.'" Rogoff: The Worst Is Over? Are You Kidding? A lot of us have seen the cautionary signposts for years. None of what approaches should be a shock to anyone. Many have taken steps to prepare for this or a similar catastrophic event to ensure us at least a chance at providing for the needs of our loved ones through the most difficult of times. I guess if there is a surprise I see registered among fellow world-watchers and crisis-contras, it is that the whole process of collapse is an agonizing slow-motion shimmy. Many envisioned disaster that comes instantly or perhaps overnight--with a clearly recognizable sign from the heavens that signals it's time to pack up the moped, head for the hills, and never look back. You know ... maybe the legendary apocryphal all-out nuclear exchange that decimates the civilized world in minutes is what some planners had in mind. Or in the event of economic collapse, a financial implosion distinguishable by a hailstorm of stockbrokers leaping from tall towers and pitchfork-wielding peasants storming banks and convenience stores for their final entitlements. But no. Now the historians tell us that even in that storied Great Depression of 1929-Crash-fame (and beyond), folks didn't understand it for what it was until they were maybe midway through it. That is, years into the debacle ... one day suddenly realizing ... hey, boiling up shoe-leather soup is not what we used to call normal dinner-table fare ... how did this happen? I really don't mean to denigrate the suffering of those people back then, nor our own ill-informed preconceptions of what our incarnation of "the end" might be. Fact is, it's a blessing that this declining period of pre-ruination allows for so many more folks out there to urgently lay in supplies and gear for the long cold nights ahead. After all, the more of us prepared for mass shortages and suffering, the better off we all will be. This is what we have--a chance to encourage those around you to prepare. If you want, pretend like you yourself just woke up to the fact that, OH MY GOSH, WE NEED TO DO THIS NOW!, if you want to keep your long-held, deep, calm determination to survive a closely-guarded secret. Some folks still just need a proverbial slap across the face to move them off the dime. Some may be in shock, unable to discern what they need to do. After all, many have already and/or continue to lose their life savings and the assets they thought were their tickets to a graceful swan song into their golden years. Be gentle with them, but make sure those nearest to you get it done. If they deny the need now, they are just plain fools. I took delivery of the new Kindle 2 (distributed solely by Amazon) a few days ago and I have to tell you, I have been in informational download heaven ever since. 1. Amazon price is $369.00 plus shipping. Reasonable if you recognize the info capacity the unit provides wherever you are, wherever you want to go. 2. The unit is the height and width of a larger paperback, the thickness of a piece of corrugated cardboard ... 8" x 5.3" x 0.36", 10.2 ounces. In other words--amazingly portable and lightweight. 3. You buy your Kindle and they ship it to you pre-programmed with your Amazon account info. The wireless network you use to download books and periodicals is free and near as I can tell--it is pretty much everywhere. You can turn your wireless connection off when you are not going to download anything. 4. Much of the Kindle content you can download is actually free. I've downloaded the KJV Bible, the Encyclopedia Britannica, several collections of the greatest novels in history, several current best-sellers that appeal to me, many how-to books that I'll probably never open until I have to, and of course many of the best survival-type books on the market. I've spent about $150 on all that. 5. I will continue to build my handheld library as I think of the types of knowledge I want to have on hand. The thing holds about 1000 books! So far, I'm up to about 25, I think. 6. Oh ... and as for actually using it and reading off the screen--it's a pleasure. 7. Get this--it has "read-to-me" mode that allows you to multi-task or have several people listen at once. The voice is variable and speed is adjustable. 8. Battery life, by all reports and from what I have gathered so far is amazing. Use it continuously; with wireless turned off you'll be reading for two weeks before you need another charge. Charging takes about 4 hours. You can do it from an outlet or via a supplied USB cable. What that means to bunker rats like me is that you can easily recharge it using any number of solar or hand-crank charging units available out there. Hence ... everything else can literally collapse around me, yet me and mine in our bunker (or on the road) will have enough of the basic useful wisdom of civilization at our fingertips to scratch out a new life from the ruins (or so the plan goes). March 29 update: I now have well over 100 books and reference volumes on my Kindle 2. I am ecstatic about the amount of information at my fingertips to be referenced at will!